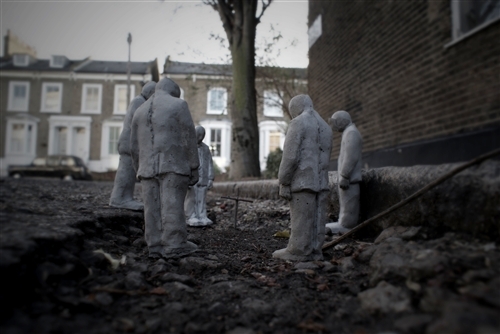 The Spanish artist Isaac Cordal has been working on his series entitled 'Cement Eclipses: The human being becomes part of the urban furniture' since 2006. Most recently Isaac has been working in London and Brussels. 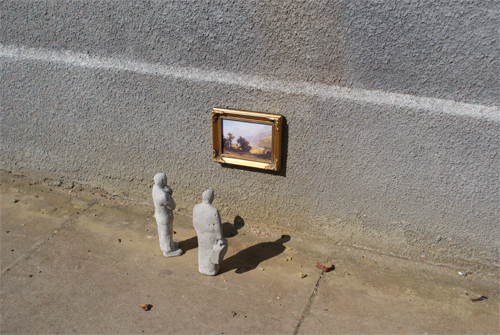 His motivation for the series derives from a concern over expansive urban land speculation, and a metamorphosis he perceives in the urban dweller who "abandons his role as a citizen", and "confirms his voluntary isolation from nature", by accepting a position alongside the pavements, streets and walls as just another part of the urban furniture. In so doing the urban dweller reduces themselves to a function of that environment. This can be compared to the graffiti that can be found in the same space, and also share the same fate of being erased, painted over, and so on. 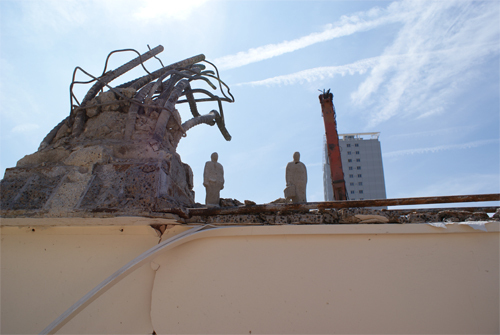 Perhaps the next place that this particular work can be discovered is on the shelf of the person who found them, or the figure's fate would finally be to be converted into part of the urban rubble. 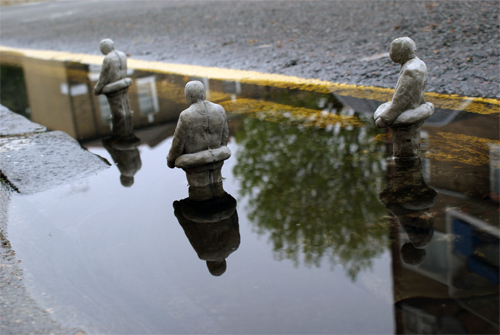 Isaacs photos of his work convey the sense that even when his figures are placed together, they remain isolated and alone. 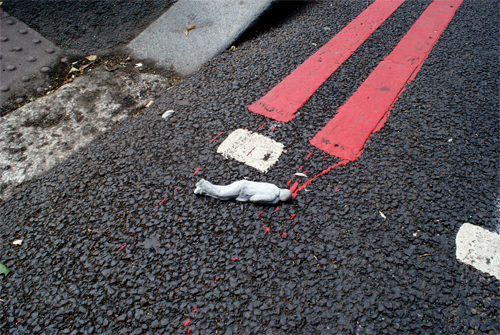 And despite being made of cement, they are no less subject to the vicissitudes of life in the urban environment. Many thanks to Isaac for kindly permitting me to reproduce his photographs of the series on Urban Orienteer. More of Isaacs work can be found on Flickr or on his website.